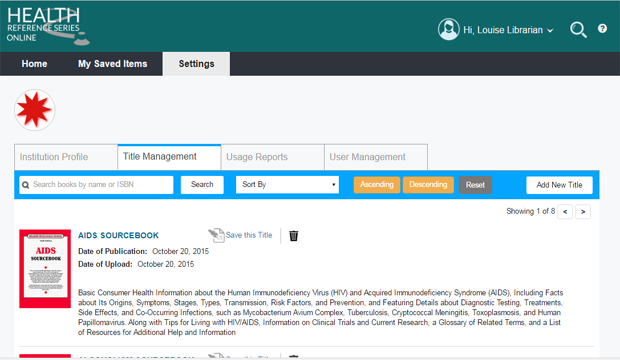 Health Reference Series Online delivers online access to publications in the Health Reference Series and Teen Health Series collections. 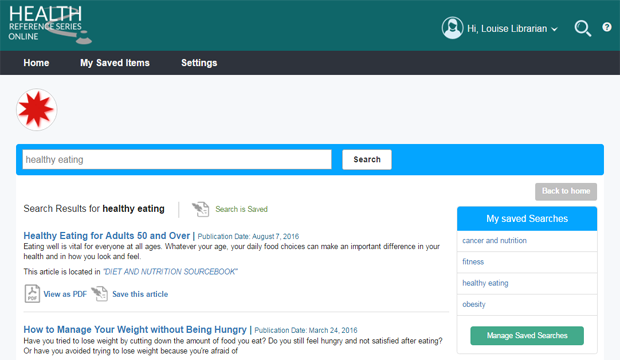 Designed for individuals with no specific medical knowledge, these easy-to-use and authoritative sources provide basic medical information for patients, families, caregivers, and the general public. 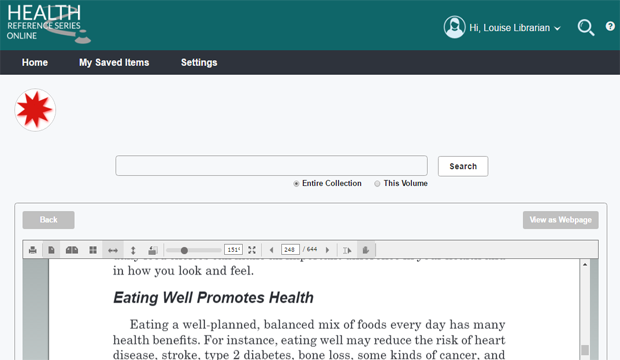 Users will find the volumes to be excellent resources for reference, research, and personal information. Choose one of two options: Subscribe to the entire database OR build your own custom database for the price of a print volume. Serve a large community with diverse health concerns? A subscription is your best bet. Subscribe to the entire series and have ongoing online-only access to over 60 current Health Reference and Teen Health Series sourcebooks, new sourcebooks, and new editions as they become available. Serve a smaller community with limited funds? 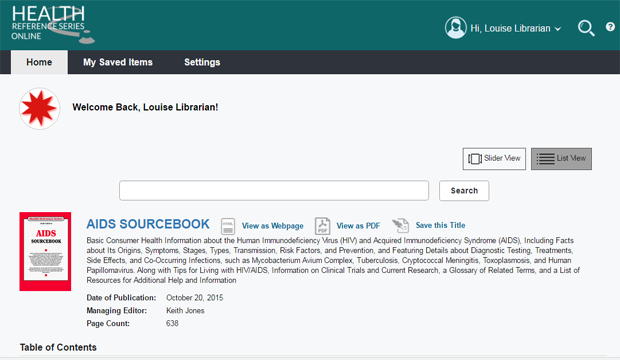 Purchase online access by the book. Meet your community’s needs while maximizing your budget by purchasing only the individual print volumes you want and receive complimentary online access to that same content. 30-Day Free Trial Click here to request a free 30 day trial. Libraries that purchase online access by the book will enjoy the same interface, tools, and functionality as subscribers. Book purchasers can enjoy access at up to two physical locations and unlimited remote access. Have Volumes Now? Or Plan to Purchase Soon? Your Content Is Waiting for You! 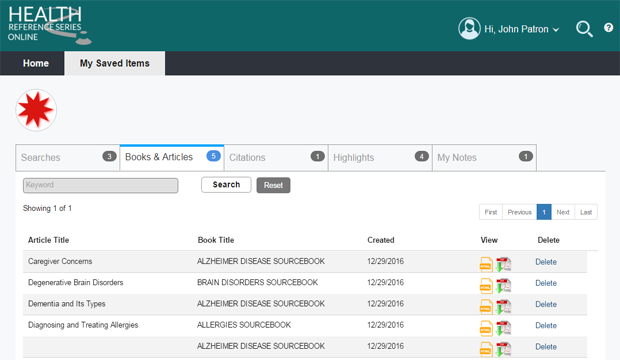 All customers who purchased volumes published in 2015 and going forward that are still in print have that same content ready to access now for free. Any eligible volumes you purchased are now ready and waiting online. Want to Access Your Content Now? Just go to online.omnigraphics.com and follow our easy registration process for instant access to your content. If you haven’t yet received your code(s), no worries! Just contact us at (800) 234-1340 or help@omnigraphics.com and we’ll get you started. 30-Day Free Trial Click here to request a free 30 day trial. Want to Add More Locations or Purchase as a Consortia? Contact your sales representative or Omnigraphics at (800) 234-1340 to learn more. Have More Questions or Want to Find Out the Latest? Click here to download our Information Sheet and FAQs. And be sure to sign up here for regular updates!